WE have heard the views of the government, politicians and the man-in-the-street on the proposed third bridge connecting Singapore and Johor. As far as I can recollect this proposed link is not the third. Tun Hussein Onn had initially proposed a second crossing at Tebing Runtuh, west of the causeway and nearer to Johor Baru. It has deep water to allow for shipping. Singapore was not agreeable to the proposal as the bridge and approach roads allegedly would traverse a security area in the republic. game of golf at Royal Johor Country Club in 1985. The writer is on the left. Some years later, Singapore prime minister Goh Chok Tong proposed a bridge from Punggol to Pulau Ubin in Singapore and onto Johor at Sungei Kim Kim. There was no further discussion on the proposal as it was overtaken by events leading to the construction of the Second Link. In my opinion, the building of concrete bridges is of secondary importance. The bonding of a human relationship based on trust, mutual respect and good neighbourliness is essential. formal rigmarole of the foreign office. In fact, the bond of friendship and goodwill had been established earlier by our rulers, and continued by Sultan Iskandar. This is manifested when senior ministers from the republic visit the sultan on Hari Raya. The sultan had conferred the First Class Order of the Crown of Johor to Lee Kuan Yew and Goh Chok Tong, further cementing the strong ties between the two countries. The National University of Singapore gave due recognition to the sultan's role in forging this bilateral friendship by conferring on him the honorary degree of Doctor of Laws last year. Sultan Iskandar captained Johor while Goh Chok Tong led the Singapore contingent. The Royal Malaysia Police also held competitions with their Singapore counterparts. The outcome of such competitions was not important. The games were used as a forum for discussions and problem solving for mutual benefit. The encounters did not end on the golf course. A Singapore government delegation's visit to celebrate Hari Raya in Johor at the Menteri Besar's residence is reciprocated with a Johor's visit to Singapore's cabinet for Chinese New Year. In between these occasions, there were informal visits and contacts made by both parties. I remember vividly the final acceptance to our negotiations for compensation for the Lingui Dam was announced by Goh Chok Tong during Chap Goh Mei, remarking I was a difficult negotiator. 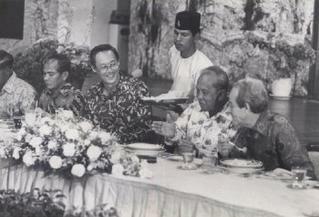 I had close relations with Goh when he was the republic's deputy prime minister and minister of defence. We could contact each other directly, bypassing secretaries. One day, he expressed his wish to have a round of golf with me at Desaru, and that he will come incognito. He arrived by boat at Tanjung Penggileh where I welcomed him. On another occasion, he invited me for tea in his office at the ministry of defence a day before he assumed the post of prime minister. He called me to brief on Singapore's three-quarter tank policy for its citizens entering Johor so I could in turn inform the Johor and Malaysia administration. His intention was to let us know before the implementation of the republic's policy that may affect Johor and Malaysia. Many problems were resolved through direct contact. There was no necessity for letters. I remember one day at the Abu Bakar mosque, the sultan directed me to speak to the Singaporean officials to move their pig farms that caused a foul smell from Mandai across the straits. Within the next few weeks, the farms were relocated. Recent developments however have shaken the very foundations of friendship and understanding that have been established over the centuries. I sense there is a general perception that Singapore's seemingly unilateral decisions are unacceptable to Johor. We view the verdict by the World Court over Pulau Batu Putih as tantamount to Singapore's disrespect and infringement on Johor's sovereignty. Sultan Iskandar is adamant and had sent a clear message during a State Assembly sitting last year that Pulau Batu Putih belongs to Johor. The rescinding of complimentary vehicle entry permits to members of the royal family is seen as the last straw that makes mending of fences difficult if not impossible. The proposal for a third link mooted by Singapore and vetoed by Sultan Iskandar may not materialise after all.